This is a short example of how to fit lightcurves in SNooPy. Here's the situation. You've got some data that is in an ASCII file that SNooPy understands (see the manual), let's say SN1981D.txt. 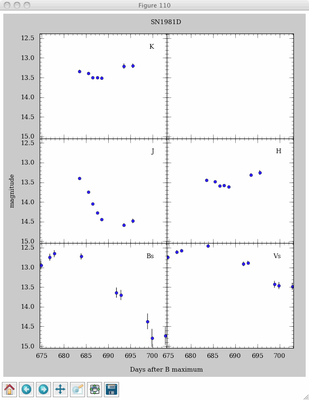 This optical data was taken in some photometric system that is best described by the "standard" Landolt system with filters defined by Johnson and Morgan (hence we define them as Bs and Vs). 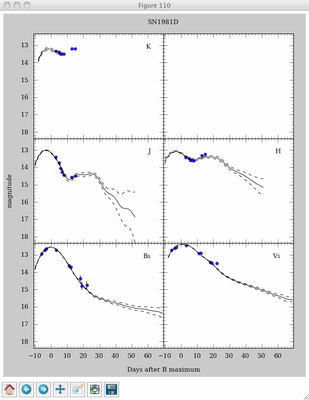 The NIR data is close enough to the CSP NIR system that we just use 'J', 'H' and 'K'. Note that the times in the data file are in units of days relative to an arbitrary zero-point, which has no effect on the fitting other than the zero-point of date-related output parameters (like the time of B-band maximum). You can choose, JD, MJD, or even DJD (google it). First, we start up SNooPy and load in the text file. Now the data is associated with the supernova object, s. You can get a summary of the status so far. Simply specify which filters to fit (or omit the list to fit them all). What actually happens: 1) SNooPy makes an initial fit to determine time of B-maximum, 2) initial k-corrections are determined from the Hsiao et al. (2007) SED templates, 3) another fit is made, this time including k-corrections, 4) the fit model is used to compute colors as a function of time, 5) improved k-corrections are computed, warping the Hsiao SED to match the observed colors, 6) a final fit is done with the color-matched k-corrections. What you see: the final fit plotted out. Now, when we print the summary, there's more. That will create a whole bunch of files, two for each filter (data plus model).